It has been said that both modern philosophy and modern mathematics began with the work of Rene Descartes. His analytic method of thinking focused attention on the problem of how we know (epistemology), which has occupied philosophers ever since. Descartes was educated at the renowned Jesuit school of La Fleche where he was taught philosophy, science, and mathematics. He earned a law degree and then volunteered for the military in order to broaden his experience. When his duties allowed he continued his studies in mathematics and science. Eventually he became dissatisfied with the unsystematic methods utilized by the previous authorities in science, since he concluded they had not "produced anything which was not in dispute and consequently doubtful" (1, p. 6). The only exception to this was in the field of mathematics which he believed was built on a "solid foundation" (1, p.5). Medieval science, on the other hand, was largely based on authorities from the past rather than observations in the present, therefore Descartes decided to conduct a personal plan of investigation. But, for Descartes, even his personal observation of the "book of nature" (1, p. 7) was not sufficiently beyond doubt because of his concern about the "deception of the senses." After consideration of all the previous methods of inquiry Descartes decided that there must be a better way; and in his Discourse on Method he wrote, "I eventually reached the decision to study my own self, and choose the right path" (1, p. 7). - The first rule was never to accept anything as true unless I recognized it to be evidently such: that is, carefully to avoid precipitation and prejudgment, and to include nothing in my conclusions unless it presented itself so clearly and distinctly to my mind that there was no occasion to doubt it. - The second was to divide each of the difficulties which I encountered into as many parts as possible, and as might be required for an easier solution. - The third was to think in an orderly fashion, beginning with the things which were simplest and easiest to understand, and gradually and by degrees reaching toward more complex knowledge, even treating as though ordered materials which were not necessarily so. - The last was always to make enumerations so complete, and reviews so general, that I would be certain that nothing was omitted. In short, his method required (1) accepting as "truth" only clear, distinct ideas that could not be doubted, (2) breaking a problem down into parts, (3) deducing one conclusion from another, and (4) conducting a systematic synthesis of all things. Descartes based his entire philosophical approach to science on this deductive method of reasoning. Descartes was highly optimistic about his plan to reconstruct a new and fully reliable body of knowledge. He even wondered if among "all things knowable to men" there might not be a proper application of his method so that "there cannot be any propositions so abstruse that we cannot prove them, or so recondite that we can not discover them" (1, p. 13). The apparently global scope of Descartes' speculations might lead some to conclude that his epistemology demanded the rejection of all authority, including the Bible. In point of fact, he considered himself a good Catholic and with respect to the "truths of revelation" he clearly stated, "I would not have dared to ... submit them to the weakness of my reasonings" (1, p.5). Ultimately it was his religion that kept him from living in a cocoon of personal introspection. However, Descartes did plant the seeds for later dissent from the theistic view of the world allowing for the humanistic dependence on human reason alone. It was left to the humanists who followed to assert an all encompassing rationalism that would take human reason as the sole measure of what constitutes "truth." Francis Bacon has been called the major prophet of the Scientific Revolution. At the age of twelve Bacon went to study at Trinity College, Cambridge, later acquired an education in law, and was eventually admitted to the bar. He next embarked on a political career in the hope that it would allow him to advance his emerging ideas for the advancement of science. In due time he acquired a seat in the House of Commons, was knighted, held the position of Lord Chancellor and Baron Verulam, and Viscount St. Albans. He gained fame as a speaker in Parliament and as a lawyer in some famous trials in which he was considered an expert on English constitutional law. An outstanding thinker, Bacon was motivated to write in areas as far-reaching as science and civil government in a battle against the old order of scholasticism with its slavish dependence on accepted authorities. He advocated the view that whatever the "mind seizes and dwells upon with particular satisfaction is to be held in suspicion" (3, p 477). His passion for the advancement of natural philosophy was rooted in his belief that science was dependent on and the key to technological progress. Much of his greatest philosophical effort was applied to the Novum Organum in which he described the inductive method of reasoning for the interpretation of nature. - Idols of the tribe: False notions due to the human nature and common to all men. An example would be geocentricity which was due to the limits of human insight. - Idols of the cave: Personal interpretations due to individual makeup or disposition. An example would be Gilbert's "magnetic world view." - Idols of the market-place: The problem of language and the confusion of words and terms. An example of this relates to the problem with definitions of words which likewise depend upon words. - Idols of the theatre: The dogmas of philosophies that are received from wrong "laws of demonstration." This involves the results of the Aristotelian method of syllogistic argumentation. In contrast to these, Bacon said that a true science progressed "in a just scale of ascent, and by successive steps not interrupted or broken, we rise from particulars to lesser axioms; and then to middle axioms, one above the other; and last of all to the most general" (3, p. 519). In short, his method required (1) accumulating a store of particular empirical observations, (2) from these inductively inferring lesser axioms, (3) from these inductively inferring middle axioms, (3) and then proposing the most general of notions, each in progressive steps. If we read modern meaning into the language used by Bacon, we might see a foreshadowing of the idea of a hypothesis in a "lesser axiom" and a theory in the "middle axiom." This would make his method agree with the mature conception of science in use today; however, the context indicates that his ideas were not yet so fully developed. Bacon also argued that this inductive method "must be used not only to discover axioms, but also notions," which may be taken to correspond to the concept of a paradigm, but again this may be reading into the text. In any case, it is clear that Bacon's view of the scientific method is progressive and cumulative. The radical commitment to empiricism advocated by Bacon may imply for some that he did not accept any knowledge that was not received by personal observation. This is a mistakenly narrow interpretation of Bacon's view of natural philosophy which he believed was given as the "most faithful handmaid" of religion (3, p. 509). Bacon actually saw his new way of acquiring knowledge as a fulfillment of Biblical prophecy concerning the last days: "Many shall go to and fro, and knowledge shall be increased" (Dan 12:4). Further, he saw the technological advancement of science as a restoration of the "dominion mandate" (Gen 1:28), and thus he wrote, "man by the fall fell at the same time from his state of innocency and from his dominion over creation. Both of these losses however can even in this life be in some parts repaired; the former by religion and faith, the latter by the arts and sciences" (4, p. 267). There was, however, reason to believe that Bacon's views would play into the hands of humanistic concerns, since he also believed that his inductive method would "extend more widely the limits, of the power and greatness of man," and one day "embrace everything" (3, pp. 527, 536). For those who later advocated a "scientific world view," this prediction was claimed to be fulfilled. The differences between the methods of Descartes and Bacon are many and deep, but there are also many things they have in common. Each of these pioneers advocated the complete overthrow of all the methods and most of the results of the authorities that came before them. Both of these men demanded a new standard of precision, since there were so many examples of sloppy reasoning and observation that littered the path of the science of the past. There was also a common commitment to doubt in general and a concern about the "deceptions of the senses" (3, p. 474). In addition, they believed in the reduction of problems to their smallest constituent parts as a general principle. Descartes and Bacon each saw himself primarily in the role of an advocate for science and therefore they contributed very little to any particular field of empirical science (5). Finally, both of these men were uniquely gifted to promote the particular aspects of science that were eventually crucial to its advance. The most obvious difference in methodology between Descartes and Bacon was related to their procedures for reasoning. Descartes began with intuitively derived principles that were taken as the premises in the standard deductive method of reasoning, but Bacon began with empirical observations that were used to inductively educe higher axioms. Descartes' method was a "top down" approach, whereas Bacon's was "bottom up." So strong is this particular contrast that it seems at times that Bacon was writing specifically about Descartes' method as an example of what was wrong in science. A crucial difference in the background of the two men is seen in the mathematical mastery of Descartes as compared to the mathematical neglect of Bacon. Descartes is noted for his great accomplishments in the areas of algebra and geometry, whereas Bacon's spoke little of mathematics since his area of expertise was law. Background may explain the similarities in the method of Descartes which parallels that of mathematical proofs. For Bacon the empirical observations he emphasized for science may parallel the kind of "eye witness" evidence he required when building a case in a court of law. 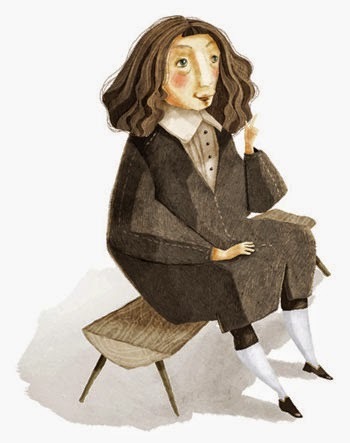 In view of Descartes background it appears obvious that his exemplar would be found among the mathematicians who he said "alone have been able to find some demonstrations, some certain and evident reasons." Therefore, he decided to "begin where they did" (1, p. 13). In spite of Bacon's distinguished background he was actually very pragmatic in his pursuit of an exemplar which he found among the "mechanics." It was the "mechanical arts which were founded on nature and the light of experience" (3, p. 493). Because of this observation he was greatly impressed with the discovery of printing, gunpowder, and the magnet. In his view "no empire, no sect, no star seems to have exerted greater power and influence in human affairs than these mechanical discoveries" (3, pp. 538, 539). It is important to note that as different as the methods of Descartes and Bacon were, when the their exemplars are synthesized into one, we have an anticipation of the modern mathematical-experimentalist. We can now see that when taken together, Rene Descartes and Francis Bacon were germinal for the modern scientific method. 1. Rene Descartes, Discourse on Method, Trans. L. J. Lafleur. (Bobbs-Merrill, 1950). 2. Rene Decartes, Meditations, Trans. L. J. Lafleur. (Bobbs-Merrill, 1960). 5. Descartes did, however, contribute greatly to mathematics which is the proper place of application for his deductive method.